With the successor of the popular NGT-Series -the Codan-Envoy- digital voice communication (DV) will become available on the MF/HF bands. The Envoy is a compact black-box-system with a complete user interface integrated into the hand-mic. So it is ideally designed for mobile installation, where space is limited. 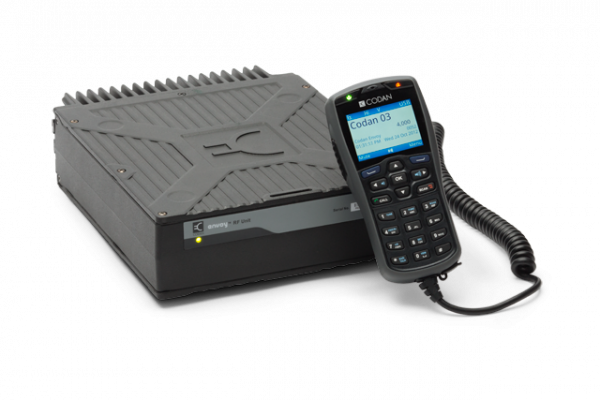 With digital voice, software upgradability, IP capability, multi-language support and an embedded software modem — the Codan Envoy sets a new standard for HF radio. View our video demonstration of Codan Envoy's Long Range Digital Radio™ capability to deliver reliable and secure communications. Certainly it will also support conventional analog voice modes. Envoy’s high-resolution color display with an intuitive icon-based menu makes using your HF radio as easy as navigating your smart phone. The handset features a backlit keyset, a one-touch emergency button and can be easily updated to a different language. The Envoy makes using your HF radio easier than ever.